By Friedrich Christian Lesser. [Nordhausen: s.n., 1736]. The natural-history rare-book collection includes a growing body of publications describing, cataloging, illustrating, and/or discussing early natural-history cabinets and specimen collections. They are important to scientific researchers for identifying collections and individual specimens that are referenced in taxonomic works (and that may have served as the type on which a new species was named). In this short publication, Friedrich Christian Lesser (1692-1754) describes a number of specimens in his natural-history cabinet. 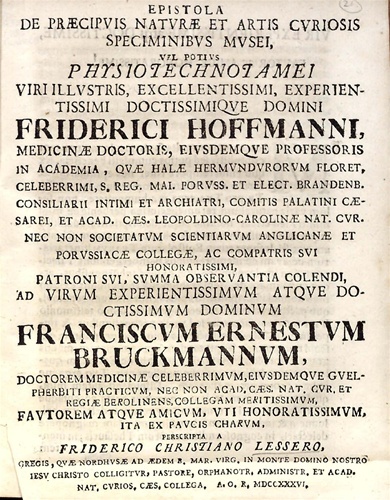 A German pastor with a strong interest in the natural sciences, he corresponded with Linnaeus and published several works on minerals, fossils, shells, and insects. The Epistola is extremely rare, held by only five libraries in Europe  and now one in North America!